The sensor signal processing, the digital drive amplifiers SD2 as cool plate version, the intermediate circuit capacitors and the feed-in and control components with power PC control. The German company Systeme + Steuerungen based in Grafenau specializes in punching and forming technology offering innovative system solutions. With an electromechanical screw press the company proves that there are powerful and efficient alternative techniques for metal forming beside the conventional hydraulic presses and punches. Drive amplifiers operate the electromechanical presses made in Lower Bavaria providing for reliability and energy efficiency of the system. Large, bulky and energy-intensive hydraulic pumps, inconsistent machining quality due to pressure fluctuations, troubles caused by leaks in hydraulic pipes, quickly worn tools and last but not least ear-deafening noise in the production hall: Manufacturers of metal parts using the hydraulically operated punching and forming technology are aware of the drawbacks this widely applied method has. Alois Weber, head of development at Systeme + Steuerungen, is also more than familiar with them, since his company is a specialist for automation and optimization of punching and forming processes. He also knows about a more efficient and reliable technology for many applications in metal processing featuring longer service life of the tools and less noise during operation. "Today, electromechanical screw presses coming with servo motors and modern drive technology can often replace the hydraulic forming technology", says Weber. "Our experience has shown that manufacturers switching to electromechanical servo presses gain technical as well as economical benefits." The Hettich group, one of the world's largest manufacturers of furniture hardware with headquarters in East Westphalian Kirchlengern (Germany), has put these benefits into practice. Drawers that glide soundlessly into dressers and kitchen cabinets that are magically accurate and gentle when closing the last centimeters: This is the result of modern furniture fittings and fixtures. These and other metal fittings are made from steel sections processed in several linked machine tools to form the material and provide for mounting holes, cuttings or stamped company logos. In autumn 2009 Alois Weber and his team developed in cooperation with Hettich, a market leader in the sector furniture hardware, prototypes of an electromechanical screw press for processing the hardware. By means of these prototypes the companies wanted to find out whether electromechanical devices could replace the hydraulic presses used until then. The result was convincing all along the line: Less than a year later Systeme + Steuerungen produced screw presses for Hettich in series. When switching from hydraulic to electromechanical metal forming, an increase in performance is one of the immediate noticeable advantages - the machines produce more parts per minute compared to the conventional technology. At the same time the energy consumption is reduced. "Before, a large hydraulic pump was required to provide sufficient oil pressure for the hydraulic cylinders. Due to the characteristics of the system this pump produced many periods of open-circuit operation and swallowed power", Alois Weber explains. In addition pressure fluctuations were inevitable during operation of several linked hydraulically operated presses. These pressure fluctuations take effect on the force generated in the cylinders causing irregular processing results. "Electromechanical presses do not have these problems. They work steadily with constant quality", Weber points out. Another advantage refers to the tool wear. The tools used in the press are exposed to much smaller loads. Hydraulic presses move to an upper stop after each cycle. Consequently at each cycle start there is a certain no-load stroke before the press drops on the tool with considerable impact. This method is very noisy on the one hand and creates high mechanical loads on the other. Electromechanical presses, by contrast, can be adjusted precisely to the used tool by means of a teach-in method. "For this reason the press moves only the stroke necessary for the processing", says Weber. There is no additional stroke from above, the press runs more quietly and smoothly. "This makes the entire system much easier to handle than a hydraulic press." The combination of modern planetary roller screws and servo motors with high power density allows for the construction of such powerful electromechanical presses. Planetary roller screws are special mechanical actuators in which polished planetary rollers encapsulated in a threaded nut with a perforated ring on each end rotate around a screw shaft. Thus, the nut moves linear along the screw. This particular construction reaches efficiencies of more than 90 %. Conventional trapezoidal spindles, in contrast, achieve efficiencies in the range of 20 to 30 % and generate much heat due to the demanded cycle times. "We must still cool the motors and the oil of the spindle by water cooling but we reach the demanded cycle times without difficulty," says Weber. The second decisive component with respect to the performance of the electromechanical presses is the drive technology. Since the company was founded in 1994 Systeme + Steuerungen cooperates with the specialist for control and drive technology Sieb & Meyer based in Lueneburg, Germany. "We found Sieb & Meyer upon the recommendation of a motor manufacturer. Back then we were looking for drive amplifiers that could be switched torque-free", Alois Weber remembers. Sieb & Meyer offered such devices and a close cooperation commenced. "Depending on the project we use mostly the digital drive amplifiers of the type SD2 and SD2S or servo amplifiers of the earlier series 26.50 in our current systems", Alois Weber relates. " Sieb & Meyer devices provide a high power density and fit into our overall concept. In addition we can trust on excellent product availability and delivery on time, even when we have to react quickly. The price-performance ratio is good as well." Sieb & Meyer also provides customized problem solutions for special projects, for example the development of electromechanical presses for Hettich. 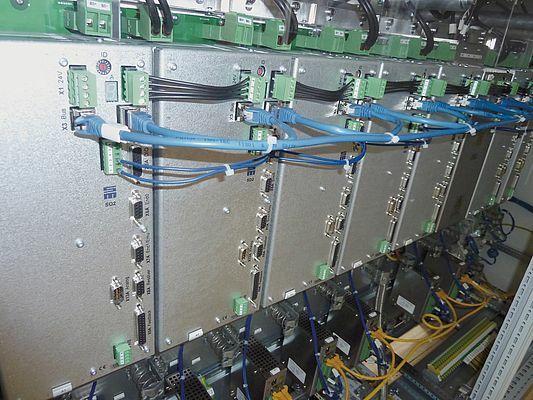 For this project the Lueneburg specialists programmed a particular module according to the demands of Systeme + Steuerungen to control the drive bus system SERVOLINK 4 within the solution concept. The SD2 drive amplifiers of all presses are connected to a higher-ranking control allowing central control of all press and teach processes. 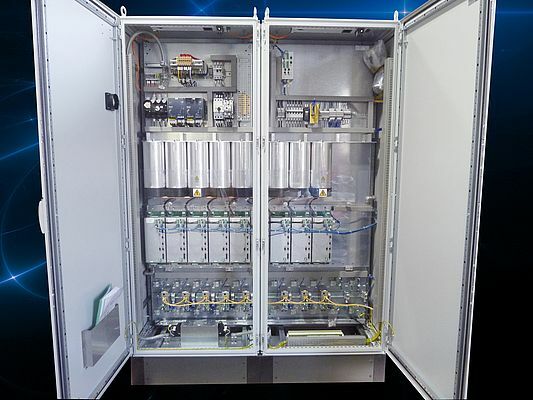 Furthermore, Sieb & Meyer supplies the optional cool plate version of the drive amplifiers SD2 for this project. "This allows for heat dissipation directly from the switch cabinet", says Weber. According to Weber the cool plate option is an ideal solution for this application, since Hettich has its own cooling water cycle in the production. Thus, there was no need for fans that increase the noise level additionally and require routine maintenance. 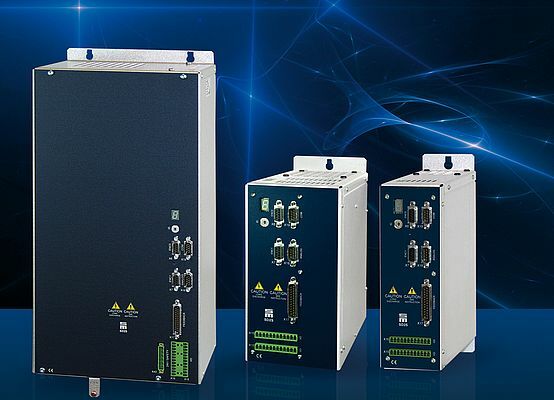 The use of SD2 drive amplifiers comes with solid economic benefits. The technology allows for utilizing the brake energy of the presses, thereby improving the energy efficiency of the complete system considerably. One punching or pressing cycle takes around 200 to 250 milliseconds. During this time the motor first accelerates and then decelerates to a complete stop. Alois Weber explains: "After braking the press there is still rotational energy available. This energy could be converted to heat by a resistor and is consequently lost. Another opportunity is using that energy for the process." Systeme + Steuerungen went for the second method. Braking the presses releases a vast amount of energy in a very short time. Thus, it is hardly technically possible to feed the energy back into the power supply system. The energy is supplied to capacitors instead. There it is practically stored for the next pressing cycle. "The SD2 drive amplifiers make accessing the intermediate circuit voltage possible. This way we can use the energy stored in the capacitors for the next pressing cycle in addition to the current taken from the power supply system", Alois Weber explains. In order to prevent overloads Sieb & Meyer modified the charging circuit in cooperation with the Grafenau developers in such a way that the energy boosts from the capacitors can be used trouble-free. For that purpose each press is equipped with a digital SD2 drive amplifier and a capacitor. All presses are connected in a common intermediate circuit, the energy from the capacitors is averaged. This method results in extensive savings: Depending on the application the press requires a total power of 2 to 2.2 kW. Using the energy stored in the capacitors saves 1 to 1.5 kW thereof. Otherwise this energy would not only be wasted but would have to be dissipated by fans or cooling systems that require extra energy.